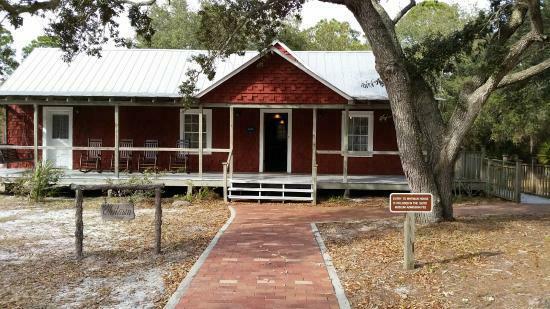 Cedar Key Museum State Park covers 18 acres, and includes the original homestead of St. Clair Whitman - whose extensive collection of seashells and native American artifacts were the basis for the first museum on Cedar Key. Mr. Whitman's original home (depicted on this page), built in 1880, has been restored and is now open to the public. In addition to the Whitman collection that is on display at the museum, are displays depicting life how it was in the early 1900's when Cedar Key was a major producer of cedar products - most especially wooden pencils. Other displays describe the importance of Cedar Key for prehistoric people, and through the Seminole and Civil Wars. One of the exhibits features a diorama of the Battle of Station Four, fought in 1865 during the Civil War. A large Confederate salt kettle used to distill salt from sea water at the Cedar Key salt works is also on display on the property. John Muir - often referred to as "the father of America's national parks" ended his walk from Kentucky to Florida here on Cedar Key in 1867. In addition to the main museum and the homestead of St. Clair Whitman, the park includes a short walking trail that extends through a lightly wooded area to the shore of Cedar Key channel. Kayaks and canoes may be launched a short distance from the parking area. The town of Cedar Key - while no longer serving as a bustling port as it did a hundred years ago - is now a quaint tourist center with restaurants and shops along the waterfront. Several hotels and bed & breakfasts cater to tourists who visit this "island city".